28 September 2018 marks the next milestone in the development of the world's biggest urban ropeway network in Bolivia. On that day, the Línea Morada, an important line in the urban transport network of La Paz and El Alto, took up operation to link the centres of these two major cities. In just a few minutes, passengers now travel "from heart to heart", a fact that is reflected in the express line's Spanish motto: "De Corazón a Corazón". 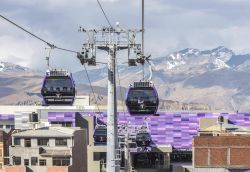 The Línea Morada is now the eighth ropeway which Doppelmayr Seilbahnen GmbH has been given the opportunity to build in La Paz/El Alto. When it comes to mobility and public transport, ropeways are not usually the first means of transport to cross a city planner's mind. The situation is quite different, however, for the Bolivian government headquarters: ever since 2014, ropeways built by Doppelmayr have been an important part of everyday life of the residents of La Paz. 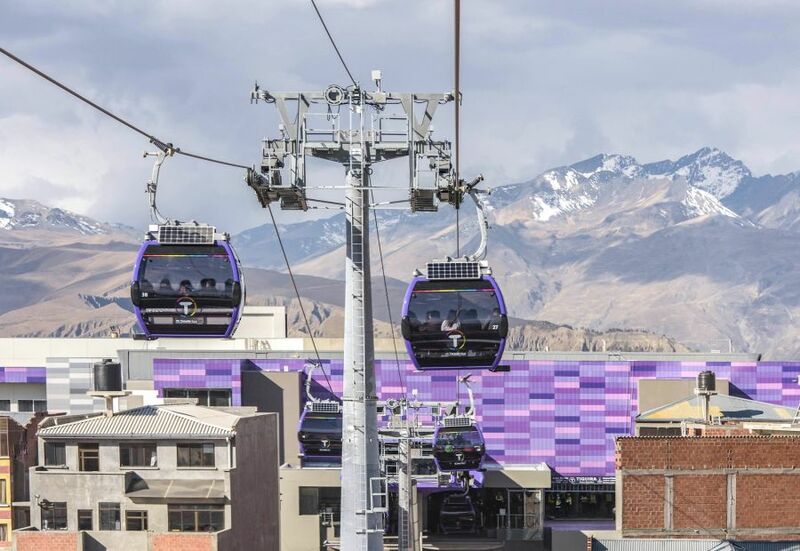 The world's biggest urban ropeway network now links the amalgamated cities La Paz and El Alto even more closely by facilitating mobility, reducing travel times and making sure everyone arrives at their destination reliably and in good time. The ropeway, which is the eighth line in the world's biggest network of urban cable cars, was officially opened in a grand ceremony by Bolivia's Vice President Álvaro García Linera along with César Dockweiler, CEO of the operating company Mi Teleférico, representatives of the manufacturer Doppelmayr, and the citizens of El Alto and La Paz. The first section of the Línea Morada (purple) links the city centre of La Paz with the town of El Alto. The first section of the Línea Morada operates at a speed of 6m/s and therefore faster than most of the other lines which run at a speed of 5m/s. Passengers can thus travel from Obelisco station in the centre of La Paz to the Faro Murillo intermediate station located in the centre of El Alto in just eight minutes. From there, the second section of the line continues into the city of El Alto all the way to the 6 de Marzo terminal station in the immediate vicinity of the international airport. 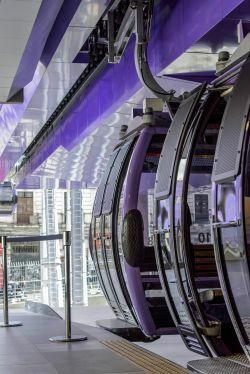 The ropeway, which travels "from heart to heart", therefore takes a total of just 16 minutes for a trip which, when travelling by road, may well take up to one hour. With an overall surface of 10,000sqm, the Faro Murillo station is the biggest station building in the ropeway network, a fact that is not only owed to additional commercial areas. Faro Murillo is about to become one of the biggest transfer stations, as this building is going to act as a station for both the Línea Morada and the Línea Plateada in the future. Upon completion of that line next year, passengers can travel to all directions from Faro Murillo by ropeway. And what's more: foresighted planning sees the station acting as a hub between the two cities, with more lines from the ropeway master plan to be integrated in the future. Mi Teleférico, the company operating the ropeway network, has given the Línea Morada a very special motto: "From heart to heart" ("De Corazón a Corazón" in Spanish), passengers travel from one city to the other, therefore also affectionately referring to their new line as "Línea EnaMorada" (a pun which translates as enamoured line.) The ropeway is thus very much an affair of the heart. 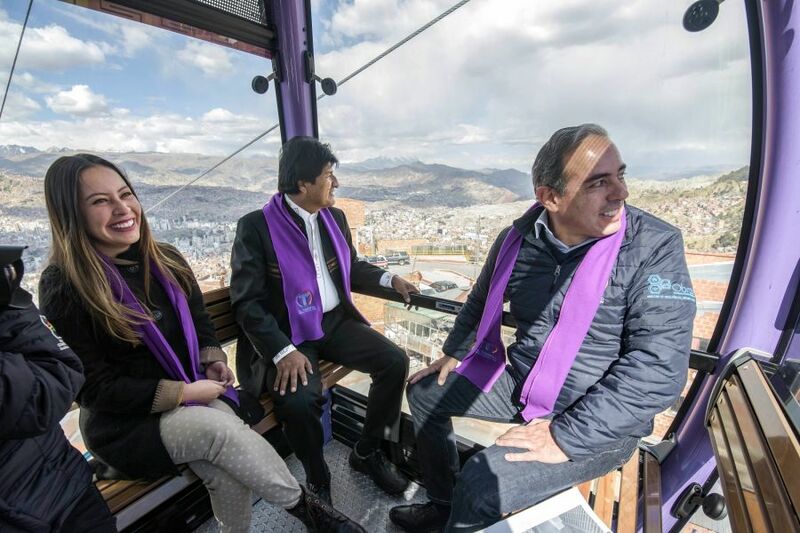 Bolivians often stress the ropeways' character as a unifying element in urban transport, something which was also highlighted by president Evo Morales on the occasion of his first journey on the Línea Morada in late August: "There is now a direct link from the heart of La Paz to the heart of El Alto. The ropeway is a role model for what public transport should be like." 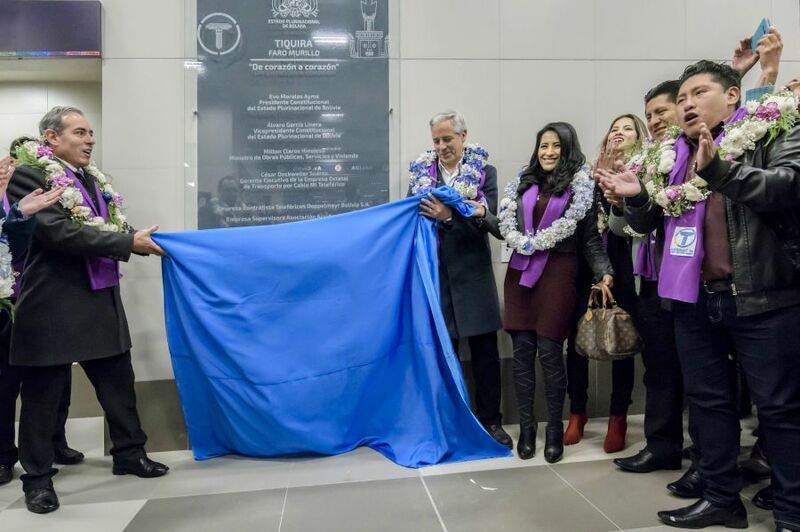 César Dockweiler, CEO of Mi Teleférico (left) and Bolivias Vice President Álvaro García Linera at the inauguration of Línea Morada in the biggest station building of the ropeways network – the station „Faro Murillo“.